Your other brothers can't deny! Oh, hello there. Don't mind me, I'm just enjoying my big floppy hat and the glamorous touch it tends to lend my outfits. Who else loves print mixing? The small floral print meshes well with the block stripes in my opinion. Or I could just be obliviously walking around, a mismatched trainwreck. Oh well! I had too much fun twirling about in my pleated skirt. My mom is such a great sport - I fiddle and mumble over my camera's settings before handing it to her and giving her a barrage of specific qualities I want from each photo. Closeups are always fun to direct - "No, no, hold it horizontally so it follows the lines of the bench." "Try cropping it in to where you see both prints together in detail but also enough of the background on the sides." Man, trying to describe what you picture in your head is tough! Then later it's all about the fun of going through each picture and editing, trying to figure out which will make the cut, how some should be cropped, and deciding on a title. Is it just me, or does anyone else struggle trying to think of creative titles? What's your process in picking a post title name? PS: In case you're wondering about the fall-esque leaves scattered about, that would be because these photos were taken quite a few months ago...like, when it was fall. Haha! Whoops! Kinda let these collect some dust, didn't I? Oh, I love this mix of prints, Linda! I really would have never thought to mix stripes with florals. And yes, yes, yes - a floppy hat is a perfect addition to any outfit, it gives a wow factor! Yes to floppy hats! 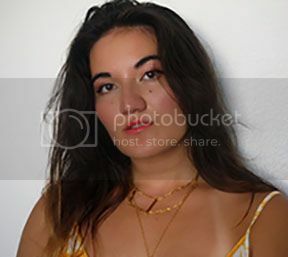 I love yours with the print mixing :) Haha and I know all too well the struggles of having my mom help take photos. Beautiful skirt and great hat! I definitely laughed out loud at the title of this post. I think your mixing of prints is spot on. And who doesn't love a floppy hat?! That hat is so adorable, but that skirt is just AMAZING. What a fantastic thrift find. I find when I can't think of anything creative to go with my outfit and/or what I am talking about, I just go on my Spotify favorite list place it on random and whatever song comes up, I'll pick a lyric from that song! Much less stress. Linda, you wear hats so well! Love the one you're wearing and these pictures are so much fun. Tell your mom she did a great job. My mom gets frustrated too easily. HaHaHa My picture taking is getting better (when I look back at my 2012) posts. CRINGE!!!!!! HaHaHa I always have a lot of photos and have to go through them all. More bad then good! LOL I always choose the title at the very very end of writing everything. Nice outfit, I love this skirt! Haha, that's actually how my mum takes my blog pictures too, haha. Nice look! Love your hat, I own a similar one but I feel silly with it ..It's always on my eyes :P Maybe it just needs getting used to. yeah i can see how much you love your big hat, Linda! haha i love this combination of florals and stripes. and haha it's so cute directing your own mom to photograph you - she's so supportive. you're so lucky you have such a mom! haha love the title! the hat is amazing, you look great! LOL I laughed at this post title, Linda! It's sort of perfect. Now we need to make a whole fashion blogger theme song from it! All the other bloggers can't deny... when a girl walks in with an itty bitty belt and a big purse in your face... haha! Haha, super cute title, I own just one wide brimmed hat and its so huge I can't even see where I am walking, lol. 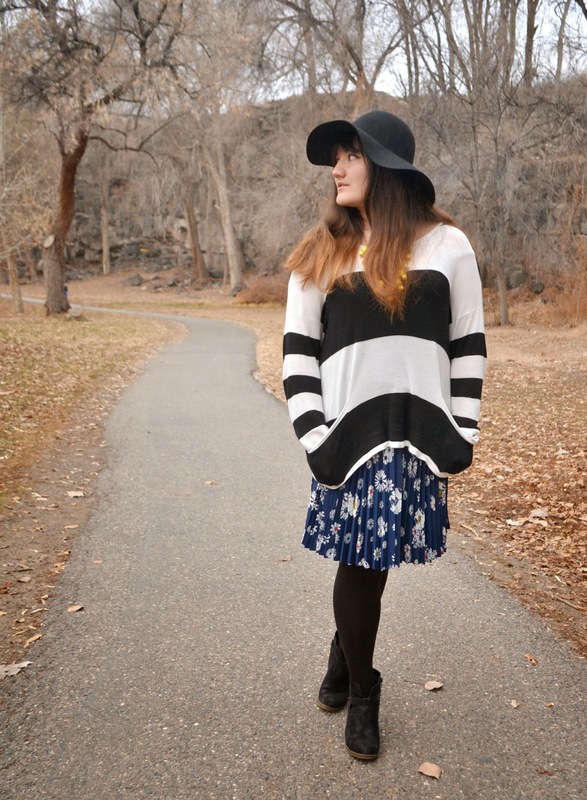 Love your floral and striped look! It was great hearing your opinion on my last post. I love your gorgeous hat! I swear whenever I'm having a bad "outfit" day or a bad hair day, throwing on a great hat always seems to fix it. I absolutely love this style of hat, I had one just like it and wore it always this summer, until my cat ruined it! Linda, I love your personality, it truly guides your fabulous style. I am a print mixing fan and I think you have done it brilliantly here. Love the floral, stripe combo, and that glorious hat is fabulous . Hats off to you and your mom! wow, this time your surroundings remind me of autumn :O true autumn! and as I just read, it actually was autumn, haha. anyway, I agree, coming up with a decent title is such a headache! it's usually the last thing I do when creating a post. oh and what a cool vintage-y skirt that is! I like! haha I don't know why but I find it so funny these were taken in fall! gorgeous colors <3 I really like that hat (can't lie) it's really cute! Hats are AWESOME and you wear them so well! haha definitely NOT a trainwreck- i always loved how flowers and stripes looked together. and my camera lamely doesn't have a remote control option so i have to make my brother and dad take my photos. with my dad it's always a lost cause- he just takes the pictures willy nilly and i have to go in and crop them so they look *somewhat* pleasing, haha! 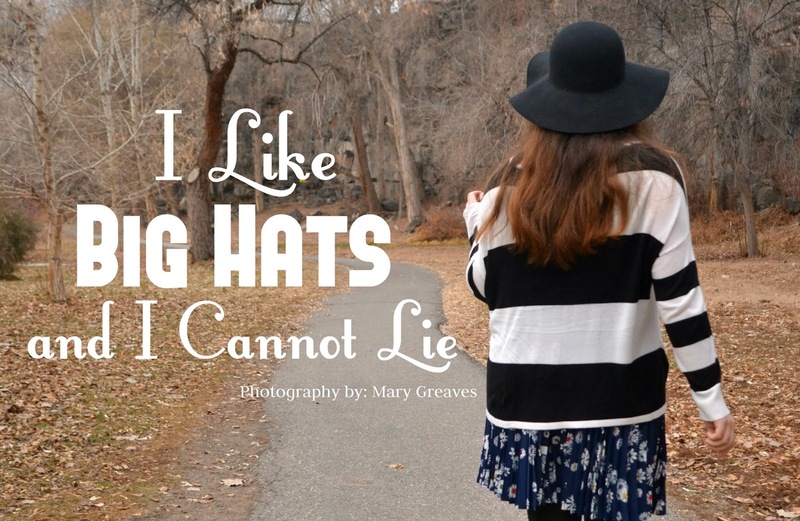 Well, you should definitely continue loving big hats :) They look wonderful on you! i love the fall vibe with this print mixing ensemble!!! !i really miss reading your posts! !